Today’s Coconut Doughnuts are in celebration of some exciting personal news. I’m happy to finally share with you all that my husband and I are having a baby! The past several months have been filled with an overflow of love, joy, and excitement; along with some overwhelming baby registry moments and stress (trying to keep that one as minimal as possible). This is our first child and she was a long time coming. We took our time before deciding to have a baby. In our twenties, we weren’t interested in having children and once our thirties rolled around we waited until we started to feel the desire to bring a child into our small family of two. We loved our lives, but the time finally felt right (if there even is such a thing). Pregnancy has been a whole new world of self-discovery for me; as I imagine it is for any new mother. 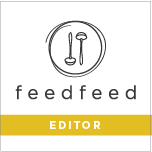 With the awareness that it’s no longer only my body that I’m feeding comes the desire and practice of eating healthier foods and how to pack each meal with as many nutrients as possible. However, for myself, eating healthier doesn’t mean sacrificing flavor or skipping dessert for nine months. To me, it means quality over quantity. 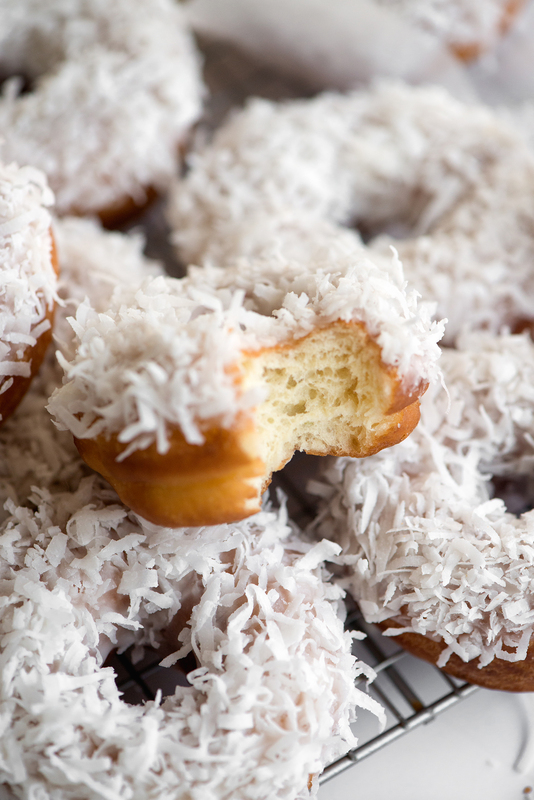 That’s where these Coconut Doughnuts come in: Fluffy yeast-leavened doughnuts that are dipped in a silken coconut milk glaze and coated with flaky shredded coconut. They are light and tender with a little lime zest in them to brighten up each bite. They were my weekend sweet-treat and worth waiting for. Doughnuts only tend to be at their best on the day that they’re made, but these glazed doughnuts were pretty great on the second morning after. The coconut milk glaze seals in the moisture of the doughnut and the flavor keeps going strong. As a coconut lover, these doughnuts are one of my favorites for the blog thus far. Although I do tend to say that about all the doughnuts on this blog. 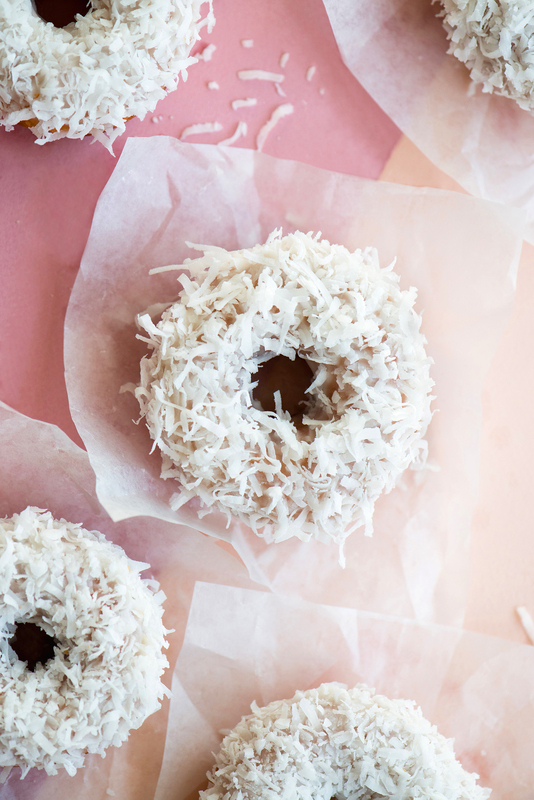 It’s still true though, so make some time for these Coconut Doughnuts soon. 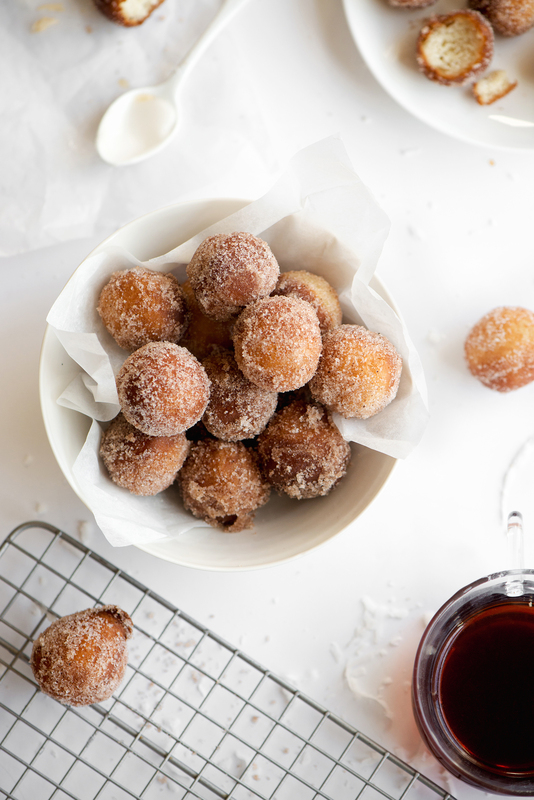 *Doughnut holes ALERT: Use the leftover dough scraps to fry up doughnut holes and then roll them in cinnamon sugar. A two-for-one doughnut recipe. *When frying, try not to fry the doughnuts for too long on each side. Over-frying can make them heavy with oil and not as fluffy tender. You’re looking for a nice and even golden color on each side; for these it was 1 minute (maybe up to two minutes, depending on your oil temperature). There’s a “sweet spot” for frying, so keep an eye on them. Warm the milk in the microwave until it’s room temperature and slightly warm to the touch (not hot), about 30 seconds. Pour the milk into the bowl of a stand mixer and sprinkle on the yeast; whisk lightly to combine. Meanwhile, in a separate large bowl, combine the sugar and lime zest. For a few seconds, rub the sugar and zest together with your fingers to impart the lime oils into the sugar. Add the flours and salt, then whisk dry mixture together. Transfer the dry ingredients to the stand mixer and then add the egg, both extracts, and soft butter. Using the dough hook attachment, mix the dough on low-speed until combined. Increase to medium-speed and continue to mix dough for another 6-8 minutes. Stop and scrape down the sides and bottom of the bowl as needed. The final dough will be soft and slightly tacky. Transfer the dough to a large bowl and cover the bowl with plastic wrap. Set aside in a warm spot on the counter and allow dough to rise until doubled in size, about 30 minutes. Meanwhile, prepare a deep fryer with oil and heat to 350F (177C) for frying the doughnuts. Or, fill a large heavy-bottomed pot with at least 2-inches of oil and attach a deep fry thermometer to the inside. Place a cooling rack onto a large baking sheet for cooling the doughnuts. Transfer the dough onto a well-floured work surface and sprinkle the top of the dough with more flour. To prevent sticking, flour the rolling pin and roll out dough to 1/2-inch thick. Using a 3-inch round cutter, cut out 12 doughnut rounds. Using a smaller 1 1/8-inch round cutter, cut out the center of each doughnut round. Reserve the dough scraps for making doughnut holes. Cover the dough rounds lightly with plastic wrap. Fry the doughnuts two at a time, for 1-2 minutes on each side, until golden brown. Transfer to the prepared cooling rack and let cool. Allow the fryer oil to reheat to 350F (177C), between each batch, before repeating the process with the remaining doughnuts. When finished, cut out small rounds from the dough scraps and fry them up as doughnut holes. Turn the holes regularly in the oil as they fry up quickly. While still warm, toss the doughnut holes in a cinnamon sugar mixture (1/2 cup of sugar combined with 1 tsp of cinnamon- or however much cinnamon you’d like) until coated. Prepare the coconut glaze and shredded coconut flakes. Dip each doughnut, about 1/2 way up the sides, into the coconut glaze. Lift doughnut directly up out of the glaze and allow excess glaze to fall back into bowl. 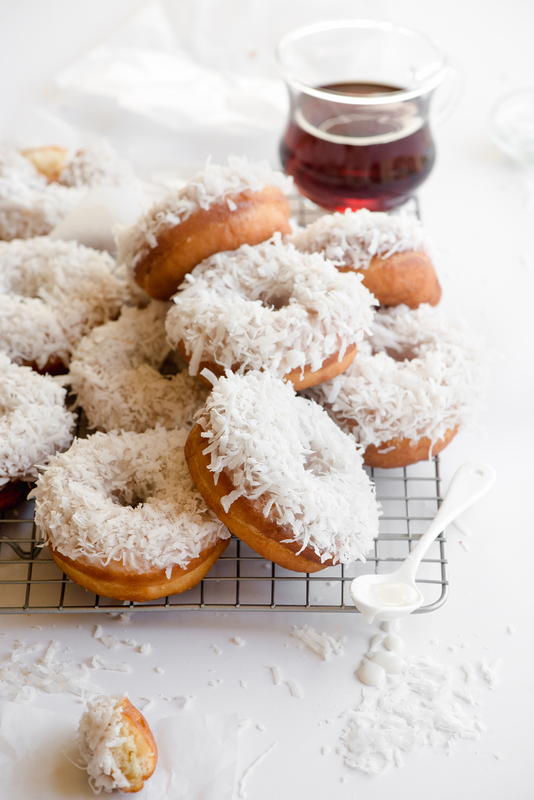 Press dipped doughnut directly into the shredded coconut flakes bowl- glaze side down. Set doughnuts back on cooling rack, glazed coconut flakes side-up, and repeat with remaining doughnuts. Coconut Doughnuts are best enjoyed the day that they’re made, but these still taste great on the second day as the glaze seals in the moisture. Store any leftover doughnuts in an airtight container, at room temperature, for up to two days. In a large bowl, whisk together powered sugar, salt, coconut milk, and both extracts until smooth. If needed, add an additional 1 tablespoon of coconut milk to glaze if it’s too thick (glaze should flow down slowly from a dipped spoon, but not be runny). In a separate wide bowl, fill the bowl with shredded coconut flakes. Your photos are just so stunning. These look amazing! Yeasted coconut doughnuts are my FAVE! And, of course, congrats!!!! Such wonderful news. Thank you and congratulations right back at you, lady! Feel free to share any pregnancy and motherhood wisdom with me in the future. I’ll be needing it. ;) Yes, yeast-risen doughnuts are soooo fluffin’ good. Thanks, Nicole! It’s an exciting time for us. I’ve been working on doughnuts lately as well, but these are something else. Such nice work! And I said it on Instagram but it’s worth repeating here: congratulations! Thank you, Maurizio! I truly appreciated your comments on Instagram and I also can’t wait to see those doughnuts of yours. No doubt they’ll be fantastic. The sweetest recipe with the sweetest news! Congratulations!! !